Pen and ink drawing with measurements of the monolithic elephant next to the Pancha Ratha at Mamallapuram in Tamil Nadu, by an anonymous artist and from an Album of 37 drawings and plans of the temples and sculptures at Mamallapuram, part of the MacKenzie Collection, c. 1816. Colin MacKenzie (1754-1821) joined the East India Company as an engineer at the age of 28 and spent the majority of his career in India. He used the salary he earned from his military career as a captain, major and finally a colonel to finance his research into the history and religion of Indian culture. During his surveys he collected and recorded details concerning every aspect of Indian architecture, language and religion, resulting in thousands of drawings and copies of inscriptions. Mamallapuram, a tiny village south of Chennai (Madras), was a flourishing port of the Pallava dynasty from the 5th - 8th centuries. The site is famous for a group of temples, a series of rock-cut caves and monolithic sculptures that were most likely created in the 7th century reign of Narasimhavarman Mahamalla. The image seen here is associated with the five rathas; monolithic buildings carved out of granite and similar in shape to the temple chariots used to carry deities in procession during temple festivities. Each Ratha is named after a hero from the Mahabharata, an epic Hindu tale. The temples are unfinished, yet they reveal the finely balanced combination of architectural elements and sculptural decoration of the classical Pallava style, which set the template for much temple building in South India. 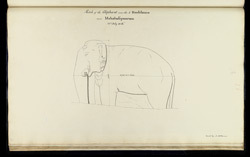 This drawing depicts the free-standing monolithic elephant sculpture near the Nakula Sahadeva Ratha.